This response was submitted to the Scottish Parliament consultation on 30/8/2013. Posted here because it is relevant not just to the anti-smoker campaign to prohibit smoking in cars but to all other cynical tobacco CONTROL attempts to exploit children and adult emotive responses to childrens’ safety, or indeed the ethos of the wider anti-smoker agenda. It has been well over five years since I personally discovered that the claims regarding passive smoking harm were grossly exaggerated and were not supported by the scientific research, yet we still see passive smoking cited as a major cause of death today by influential institutions and individuals, despite the dearth of actual verifiable cases (ie. none). This is serious cause for concern and threatens the very foundations of our society, calling into question the integrity of long respected institutions. If the public are to retain trust in medicine, science and politics then it is imperative that they hold truth inviolate and not allow it to be skewed for some/any ‘cause’ however urgent, compelling or desirable it may appear to be at the time. Unfortunately, the truth has been the first casualty in the anti-smoker assault on smokers, individual liberties and tolerant society. Frank Davis discusses the problems that arise and potential adverse effects on society when trust is lost and ‘experts’ try to ‘pull the wool’ over the eyes of a previously trusting public. That passive smoking continues to be touted as dangerous is an indictment of the inflexibility of ‘consensus science’ and the associated ‘precautionary principle’. Once the ‘consensus’ on smoking was ‘established’ years ago, the shutters were pulled down, shop closed and no evidence that tended to contradict it has been allowed to enter that hallowed hall of anti-smoker fervor, yet evidence that supports it, however absurd, is apparently unquestioningly welcomed and widely disseminated as fact. The ‘precautionary principle’ allows subjective opinions to be promoted above and beyond their value and dispenses with the need for the conclusive ‘evidence’ that would be required under normal circumstances, while ‘consensus science’ is the antithesis of true science. It should be noted that of these 25 studies NONE reach the RR 3.0 level where inferences could possibly be drawn regarding increased risk. Only ONE shows a statistically significant risk (RR 2.29) while ONE shows a statistically significant REDUCED risk (RR 0.78) (Suggesting a beneficial effect.) The remainder are NOT statistically significant, suggesting neither risk nor benefit. NINE of these lean toward weak increased risk and THIRTEEN suggest a weak beneficial effect. The overall picture suggests, if anything, that ETS is beneficial to childrens health, but as with all epidemiological study It is suggested by many that only statistical correlation’s can be shown and ‘correlation’ does NOT equal ‘causation’. The overall ‘scientific consensus’ on ETS ‘harm’ suggested by the anti-smoker industry, depending upon which studies are included/ excluded from analysis, concludes that ETS raises risk of ill health. There are various ‘consensus’ figures suggested, eg RR’s of 1.16, 1.21, 1.33, equating to between 16% and 33% increased risk (there may be others). To the layman, this may look like damning evidence, but it indicates ‘increased risk’ NOT ‘actual risk’ and many do not understand the difference. A simple analogy explains the principle; If you buy one lottery ticket, your chance (risk) of winning the jackpot is ‘X’, if you then buy another you increase your chances (raised risk) of winning by 100%. The chance (‘actual risk’) of winning is somewhat different. Even If we accept these anti-smoker figures as definitive, the actual risk is minute. 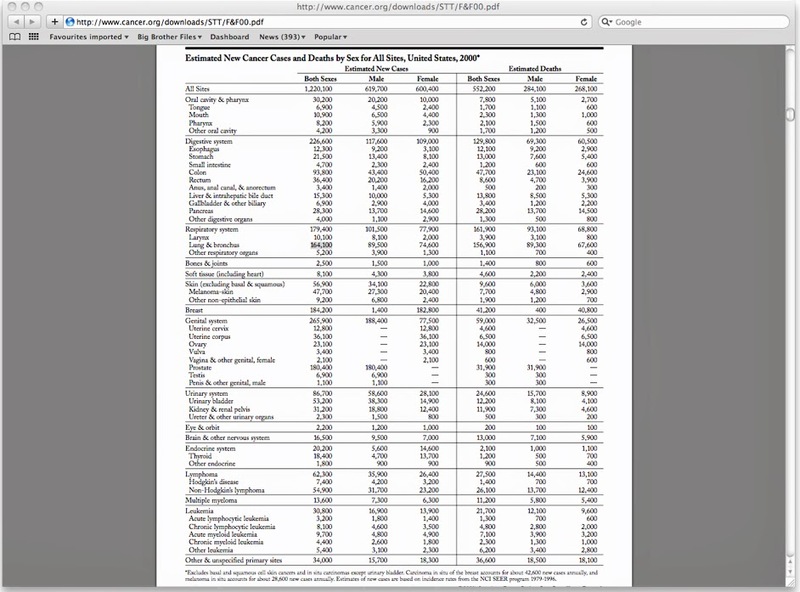 Whole Milk: significant increase in risk up to RR 2.64 – 164% increased risk. It is important to try to gain some background knowledge as to how and why this degradation of ethics and impartiality came about. It is not feasible to fully explain it here, but it is possible to demonstrate the typical culture that pervades the anti-smoker personality, providing some ‘hints’. Boffetta et al (1998). Most significant finding; Childhood ETS; OR = 0.78; 95% CI = 0.64 – 0.96. (statistically significant – protection). The Author states ; “Our results indicate no association between childhood exposure to ETS and lung cancer risk.” (which is not a lie, just not the whole truth)! It appears that the media discovered/claimed that the WHO had withheld publication of this study, but having been exposed by the media, the WHO/IARC were obliged to make the study available to the public and issue a press release. 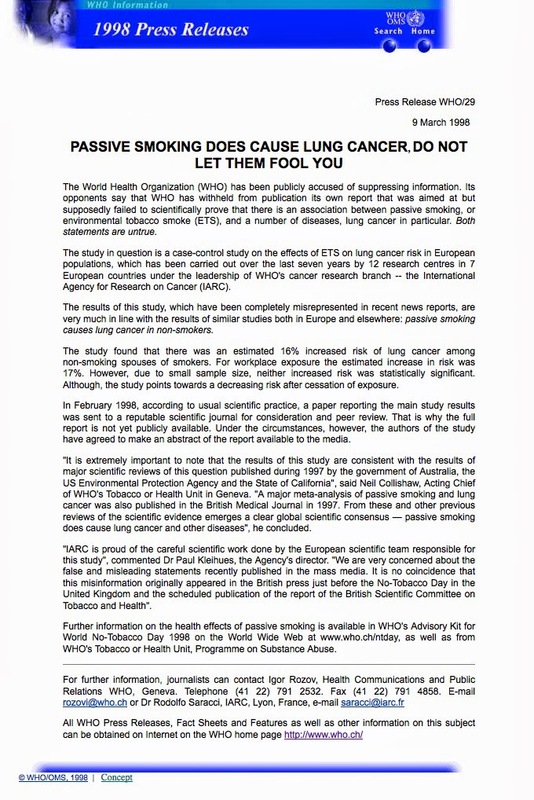 The WHO press release, entitled “Passive smoking does cause lung cancer, do not let them fool you’ (see WHO press release (1) below) emphasized the insignificant spousal and workplace results (ie. NOT scientifically significant 16% & 17% increased risks) deeming them proof of ETS ‘harm’ BUT tellingly they OMITTED to mention the results regarding childhood exposure and significantly lower lung cancer risks, the most significant finding of the whole study! Remember, this is in a press release where they deny suppressing their own information! It is the informed general public who are their real opponents. Vested/conflicting interests are regularly cited to smear anyone even tenuously associated with tobacco companies (to perpetuate the ‘good-versus-evil’ myth), yet few appear to be concerned about the conflicts/vested interests with the pharmaceutical industry by those employed within the tobacco CONTROL industry who regularly cajole, lobby, and advise government on policy etc. 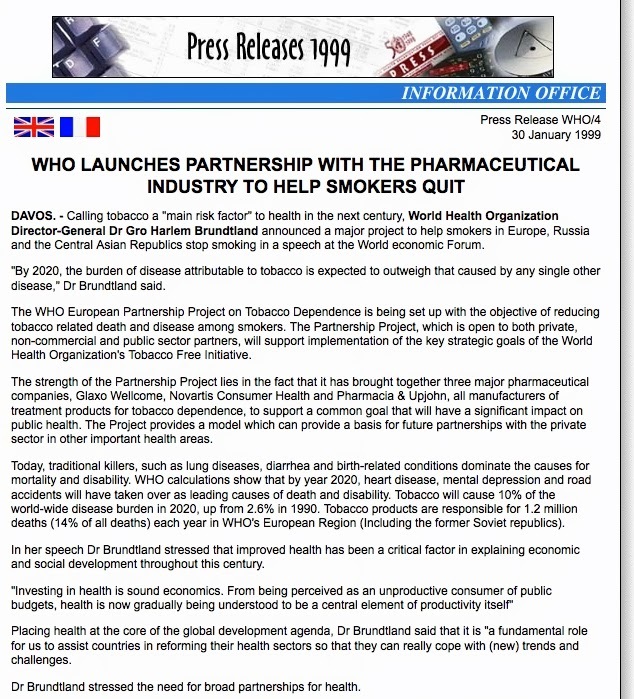 Is it a coincidence that only a few short years later, around 2003, the WHO Framework Convention on Tobacco Control (FCTC) appeared? It was signed, sealed and delivered as a fait accompli, before most people were even aware of its existence? Most relevant is Article 5.3 of the FCTC that effectively legitimizes the exclusion of any science that does not support the tobacco CONTROL consensus. Tobacco CONTROL science has been reduced to an advocacy tool, while genuine, unbiased, ethical medical science relating to smoking has been neutralized. It leaves scientists in no doubt as to what is expected from them and the inferred consequences of failure to do so. Anti-smokers often refer to their crusade as a ‘war’ and tactics such as these confirm that their campaign is indeed run along principles of war; Disarm your opponents, starve them of funding and resources, bombard them and your own supporters with propaganda to demoralize one/engineer consent with the other, then you are free to rain blows down upon them to your heart’s content, safe in the knowledge that those opponents have no effective way of fighting back. In reality, while the FCTC remains in force and those who support it remain in positions of power, any future science that supports any aspect of tobacco CONTROL is invalid. Without any effective checks/balances, they can claim anything they want to, but this results in only ensuring that what they say is not worth the paper it is reported on. They have built an unstable fortress on foundations of sand and bog that will collapse under its own weight in time.Much worse than that however, is that it has shackled science to dogma and it has prevented genuine medical science from progressing – it has set-back science and prevented research that could have improved health. It is fairly clear that while tobacco CONTROL purports to be at war with ‘tobacco companies’ and ‘public ill health’, the evidence suggests otherwise. This all adds up to the fact that today we can no longer implicitly trust scientific studies relating to smoking and health. Tobacco CONTROL originally drew our attention to this problem of untrustworthy science many years ago. They have long claimed that their opponent’s ‘science’ is fraudulent (the tobacco industry), while claiming theirs to be irreproachable. But once again, the evidence suggests otherwise. It is therefore imperative that we weigh the scientific evidence (for and against) with common sense using rational and logical thought. No specialist skills are required to identify many of the inherent contradictions and implications in anti-smoker rhetoric and science, or comparison with real life situations. Smoking prevalence over time is an important factor when evaluating the alleged effects of smoking and health, particularly when viewing the rhetoric/science from a common sense, rational, logical perspective. Smoking prevalence has been reducing in the western world for many years.The CRUK graph below shows GB male cigarette smoking had reduced (1948-2007) from 65% to just over 20%; a two-thirds reduction. Female smoking, that peaked at 45% in 1966, had reduced to 20% by 2007; a reduction of over 50%. Logic tells us that relative passive smoking exposure must have reduced substantially over the same period. 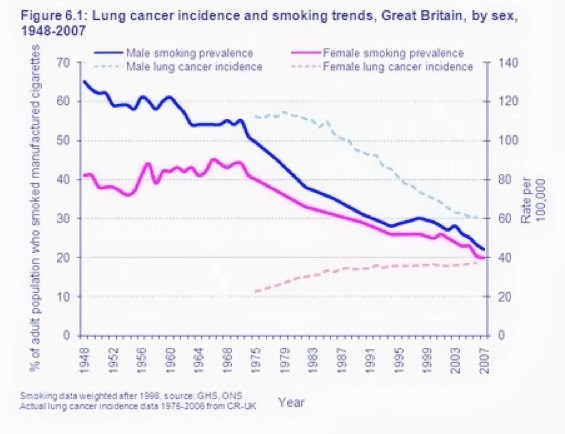 Common sense tells us that so-called ‘smoke related’ illness should also have reduced too and the graph suggests just that, but there is more to it than this graph would have us believe as discussed later in this document. Note that this graph relates to manufactured cigarette smoking only. In common with the best snake oil salesmen, anti-smokers list an almost endless number of illnesses allegedly caused by primary and passive smoke on the assumption that at least one of them should resound with most people at some point, relating to some real life situation, and also knowing that if one is exposed as harmless then there are several others left to fall back upon.Mr Hume repeats a few of these as “most common illnesses known to afflict children due to passive smoke exposure” ; lower respiratory infections, wheezing, middle ear disease, asthma, modest impairment of lung function, bacterial meningitis and sudden infant death. Let us briefly examine some of these. Firstly, for those where the operative words are highlighted in bold; Tobacco smoke does NOT contain any bacteria or virus, it is sterile but it may well be possible to identify some correlation with smoking if other factors are not fully taken into account eg social class, diet etc. In the 1980’s there was a strong correlation between the increase in sales of VHS video recorders and the rise of HIV aids, but to conclude that one causes the other is clearly absurd. “Contact with smokers is associated with increased risk of MD in adolescents. This is more likely to be due to higher carriage rates in smokers than to exposure to smoke … In epidemiological studies that assess risk from passive smoking, exposure to smoke should be differentiated where possible from contact with smokers.“ (Coen et al 2005). So the truth is NOT that exposure to second hand smoke causes meningitis in children. Unsurprisingly, it is contact with people who are carrying the meningitis bacteria that increases the probability of contracting meningitis! Is simply an infection or inflammation that can be caused by viruses or bacteria. During the same period, smoking reduced substantially and therefore children were less exposed to ETS; Less smoke but more ear infections! 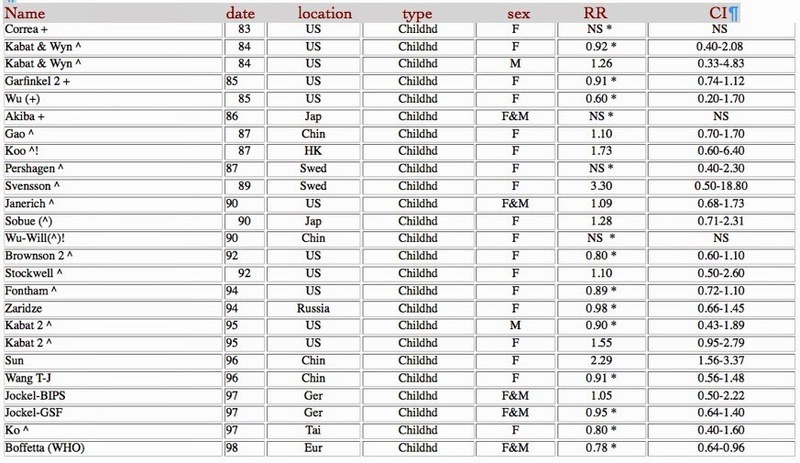 The following is a strongly worded letter that the Infant Death Syndrome Alliance sent to John Banzhaf of ASH, USA criticizing his use of misleading data and terminology when linking Sudden Infant Death Syndrome to parental smoking.“The sensational heading for one of your recent Internet reports [07/30] “Smoking Parents Are Killing Their Infants” has gone too far. The fact is, researchers still do not know what causes SIDS…Insensitive generalisations about SIDS broadcast through print or the electronic media serve only to perpetuate the public’s misconceptions…Your literature states that smoking ‘kills more than 2,000 infants each year from SIDS.’ Any published figures are sheer speculation, or guesses, not grounded in actual experimentation…we respectfully request that you adjust your message as far as SIDS is concerned. While we support your cause, we can not do so at the expense of the tens of thousands of families we represent. Thank you for your consideration of our concerns. A copy of our latest information brochure is enclosed. We welcome your reply.”Banzhaf did not reply and ASH continued to quote the statistic. Less smoke but more SIDS! Over the last twenty years or so child asthma has increased ‘manifold’ in most western countries where smoking and SHS exposure has been reducing. In USA “asthma is the leading cause of chronic illness in children. It affects as many as 10%-12% of children in the U.S. and, for unknown reasons, is steadily increasing” (medicine net 2010). 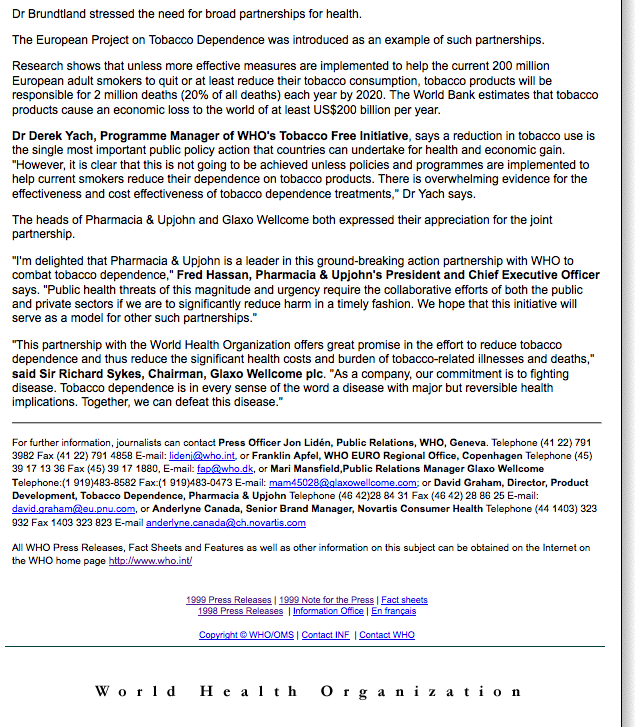 Here too, there is a wide margin between what is claimed by tobacco CONTROL sources and reality. Many people of a certain age will remember that child asthma was rare in their childhood, while people smoked everywhere, but I post a few studies relating to asthma that highlight the mismatch scientifically from different perspectives. This paper not only concludes that nicotine and hence active and passive smoking actually leads to less incidence of asthma and atopy, but gives you the etiology too. “The results unequivocally show that, even after multiple allergen sensitizations, nicotine dramatically suppresses inflammatory/allergic parameters in the lung” (Mishra et al 2008)It was not so many years ago that doctors would recommend that patients take up smoking to alleviate lung and other respiratory problems such as asthma. Given the evidence that is gradually being discovered now, it would seem to have been good advice. So what changed? Were doctors incompetent then – OR was It anti-smoker junk science that convinced them they were wrong against their better judgement or maybe a fear of losing their jobs if they deviated from the anti-smoker ‘consensus’? The window dressing;The level of ETS exposure in cars is irrelevant given the evidence that it is effectively harmless, even beneficial to children, but does it really take a tobacco CONTROL ‘scientific’ study to show how much ETS is raised or not inside a car? Do your own test; while driving, switch off climate control etc light a cigarette then open ONE window by ONE inch, preferably next to the smoker, and watch how quickly the smoke is drawn out – it takes seconds. This demonstrates a basic law of physics relating to differing air pressures. Of course it is possible to even out the internal/external pressures by opening more windows or too wide which can negate the effect to a certain extent!“Parts of Australia and Canada have done it so why don’t we follow the leaders”? Dr Segura also advances a very plausible reason as to why the WHO etc would want to blame almost all public ill health on smoking and other personal lifestyle choices. Is it OK to lie for a good cause? Many still believe the increasingly frantic hyperbole that smoking is a genocidal killer and therefore ANY means to prevent smoking is worthwhile. Who cares if bad science is being used to misrepresent the ‘dangers’ of ETS? Who cares if children are being indoctrinated and exploited, they will benefit at the end of the day won’t they? Who cares if a few filthy smokers are de-normalized and de-humanized, we all know it is all for their own good isn’t it? Many lives will be saved, so it is all worthwhile – isn’t it? Less smoking – MORE cancers! Quitting smoking does not CURE cancer nor does it appear to prevent it either! Australia; The number of new cancer cases more than doubled between 1982 and 2007. 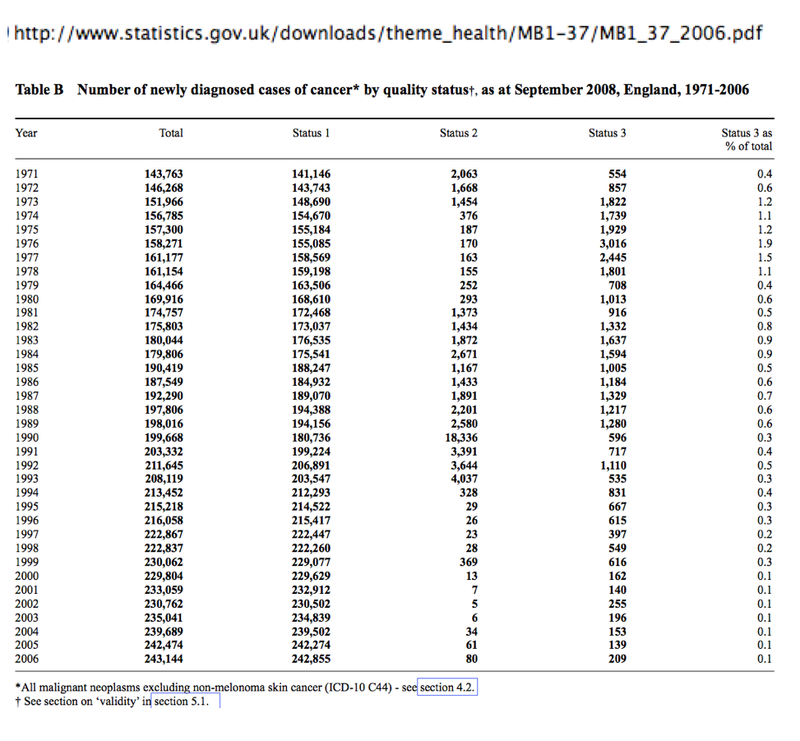 In 1982, 47,350 new cases of cancer were diagnosed in Australia compared with 108,368 cases in 2007. Smoking DOWN – ‘smoke-related’ illness UP almost everywhere in the developed world. The implications of these facts and figures should be easy to interpret by anyone with a logical brain, but years of anti-smoker propaganda has been indelibly stamped on public consciousness and many are unable to break free from it. An informative analysis/summary can be found here. This case was first intimated in 1992 and eventually heard just over ten years later. Similar to the Boffetta et al study into ETS, this big, big case was clearly considered of great importance to anti-smoker campaigners to try to prove once and for all, in the legal domain, that smoking causes lung cancer. However, In common with Boffetta, They failed to do so! Why did Doll NOT produce the data that was crucial to the anti-smoker case? The answer is self-evident. Of course, if it had been produced then he could have been cross-examined on that data and any flaws would have been exposed. Yes, that’s right – No ‘hard science’ research has been successful in inducing lung cancer in animals. Unlike, say, exposure to asbestos, where lung cancer can easily be induced in animals, ‘hard’ (real) science has never proved that smoking causes lung cancer. ‘ The closest they got to success was by painting tar (tobacco smoke condensate) on the skin of mice (discussed in [5.636]) “...but they have not been uniform and these experiments were not designed to answer, and could not answer, the question of whether or not cigarette smoking was the cause of human lung cancer.”Tobacco CONTROL may want to forget this case, it will not be quoted in any anti-smoker document – it was roundly defeated! Result; [9.15] In my opinion therefore, for all the foregoing reasons, the pursuer’s case fails on every issue on which I would have needed to find in her favour were I to hold the defenders liable to her in damages. I vehemently reject Mr Hume’s proposals in its entirety, together with most of the evidence he quotes to justify his ‘case for change’. I should not need to remind the consultation that the burden of proof lies with the prosecutor if the weight of the law is to be used for coercion. In criminal law, proof must be ‘beyond reasonable doubt’ and in civil law the less demanding ‘on the balance of probabilities’. I suggest that neither level of proof has been satisfied in this case, nor can it ever do so. Mr Hume quotes opinion polls that, if they are to be believed, even negate any suggestion that this proposed legislation is ‘necessary’. 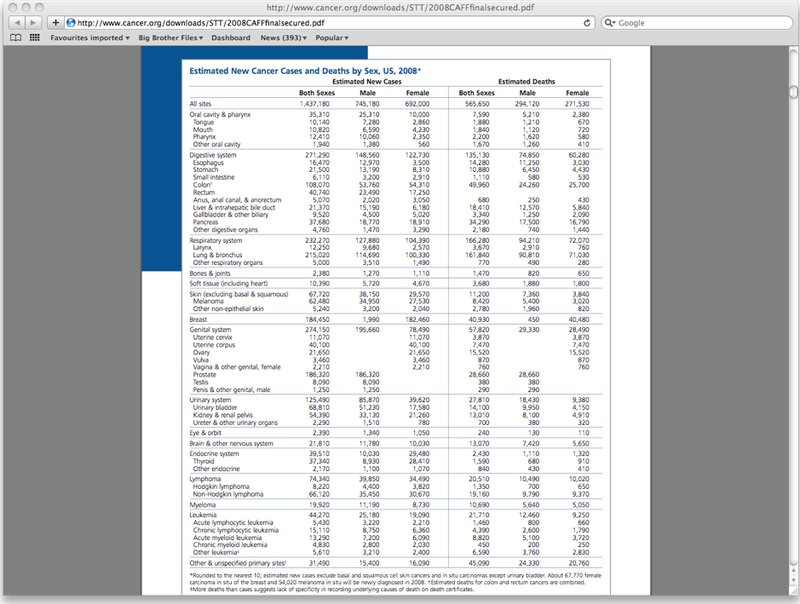 He points out that; “in 2013, support had increased to 81.5% with opposition falling to 7.4%.” (ASH Scotland). Contradictions aside, one would logically conclude from this that only a tiny fraction smoke in cars. In effect, there appears to be no problem even if ETS was a hazard, people are already complying without the need for coercion. Any resulting legislation will NOT be fit for purpose, it will not be easily enforced, nor will it improve health. It will result in an unwanted incursion by the state on individual freedoms, that will lead to even more loss of liberty as the next ‘logical step’ will be to call for legislation that will allow the state to invade private homes – to ‘protect the children’ of course! The anti-smoker campaign has already encouraged the bigot and bully resulting in discrimination and callous acts such as this! Do we really want to live in such an intolerant society held together only by threats, fear, and lies, or to exacerbate such attitudes of intolerance even more? I also submitted a response to the English (August 2014) and Welsh (October 2014) public consultations regarding smoking in cars with children present, both similar to this one above. I have yet to see any Scottish or Welsh government conclusions as a result of these consultations but I have just read the UK government’s consultation response (pdf now posted on the internet). This document makes it fairly clear that the government no longer represents the people and has become nothing more than the voice of the tobacco control industry or ‘healthism‘ fanatics in general. Somewhere down the line democracy and government by the people, for the people has been usurped! We now have government by the ‘experts’, for the ‘experts’! The ‘experts’ deem their ‘expert’ word to be unquestionably definitive, the government and public just have to comply and that’s that! This consultation on smoking/cars was supposed to be a public consultation whereby interested parties could submit their views and evidence on the proposal. It seems however that this was nothing more than a cynical exercise to give the impression (perception) that we live in a working democracy, when all along, the outcome had been pre-determined from the outset. Appendix B in the consultation response document lists, in over six pages, 111 respondents to the consultation, but it reads like an A to Z of anti-smoker activist organisations, the overwhelming majority almost entirely funded by public money! Mine was NOT listed. No doubt others who did not agree with anti-smoker ideology were similarly dropped down the memory hole! “Government agencies and councils in England that spend public money on lobbying ministers face a crackdown. This highlights just how much contempt is shown to our elected representatives and how they are just ignored. Government funded lobbyists, continue to lobby government unhindered, while the public is also ignored! That ‘crackdown’ worked really well didn’t it! Has our government been totally compromised?